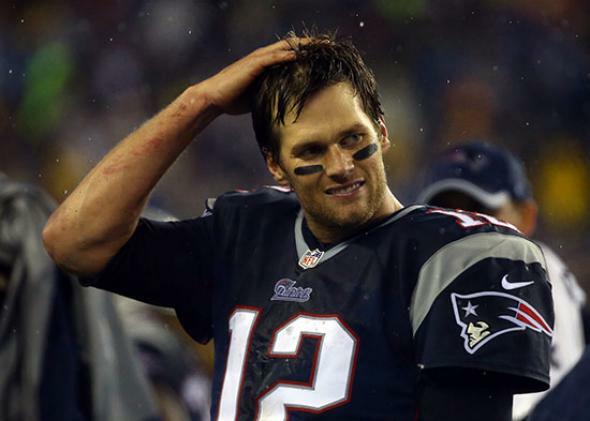 The Patriots became nearly fumble-proof after a 2006 rule change backed by Tom Brady. “The thing is, every quarterback likes [the football] a little bit different,” Tom Brady said at the time he was pushing for the rule change. In light of the ongoing ball deflation scandal consuming the New England Patriots, football data analyst Warren Sharp revisited the Patriots’ extraordinary recent fumble statistics that he covered last week and found something even more surprising. A slightly different version of this post first appeared on Sharp’s own site. It is reprinted with his permission. While speculation exists that “Deflategate” was a one-time occurrence, data I introduced last week indicated that the phenomena could have potentially been an ongoing, long-standing issue for the New England Patriots. That possibility now looks much clearer. Initially, looking at weather data, I noticed the Patriots performed extremely well in the rain, much more so than they were projected to. I followed that up by looking at the fumble data, which showed, regardless of weather or site, that the Patriots’ prevention of fumbles was nearly impossible. Ironically, both studies saw the same exact starting point: Something started for the Patriots in 2007 that is still going on today. I wanted to compare the New England Patriots’ fumble rate from 2000, when coach Bill Belichick first arrived in New England, with the rest of the NFL. One thing I found in my prior research was that dome teams fumble substantially less frequently, given that they play at least eight-plus games out of the elements each year. To keep every team on a more level playing field, I eliminated dome teams from the analysis, grabbed only regular season games, and defined plays as pass attempts added with rushes and times sacked. The below results also look only at total fumbles, not just lost fumbles. This brought us to the ability to capture plays per fumble. Based on the assumption that plays per fumble follow a normal distribution, you’d expect to see, according to random fluctuation, the results that the Patriots have gotten since 2007 once in 5,842 instances. Which in layman’s terms means that this result only being a coincidence is like winning a raffle where you have a 0.0001711874 probability to win. In other words, it’s very unlikely that results this abnormal are only due to the endogenous nature of the game. In 2006, Tom Brady (and Peyton Manning) lobbied in favor of changing an NFL rule that mandated home teams provided game balls for both teams. Brady wanted the NFL to let every team provide its own footballs to use on offense, even when that team was playing on the road. After Brady and Manning’s efforts, the NFL agreed to change the rule. Prior to that change, there would be relatively little advantage to playing with deflated footballs because both teams would be using the same balls. The statistical “jump” the Patriots make in the 2006 offseason, from one fumble every 39 plays to one fumble every 76 plays is nothing short of remarkable. Their trend line over this period is not even close to that of the rest of the NFL. The 2013 season is an oddity in that the Patriots were actually slightly worse than the rest of the NFL. Looking at that season, it’s apparent the reason: Of the Patriots’ 23 fumbles that season, six occurred in a single Sunday night game against the Broncos. That game was played in 22-degree weather, with 22 mph winds, and a wind chill of 6 degrees (cold conditions of this nature causing more fumbles than usual). It was this Week 12 “arctic” game and a Week 17 game against the Bills—which saw four fumbles—that really put the Patriots fumble rates for 2013 out of sync. This is exactly why looking at small sample sets, such as single seasons, is not the preferred method for these types of analyses. 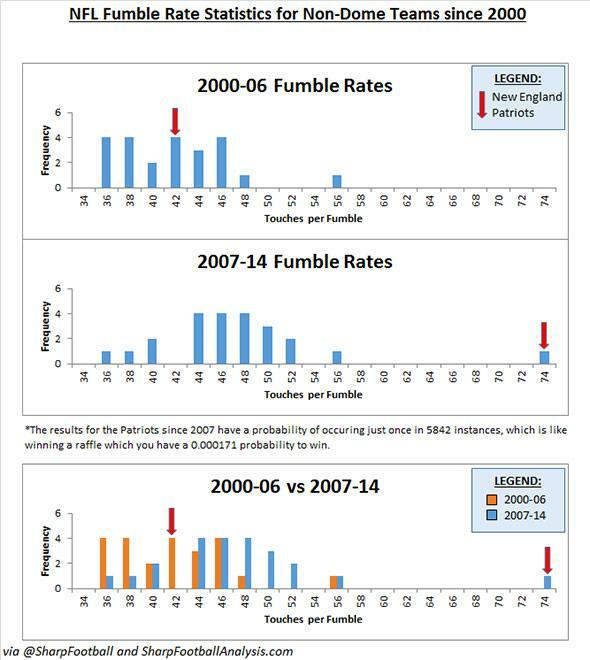 Why are fumbles so important? Because as Bill Belichick knows, perhaps as good as anyone, turnovers usually control game outcomes. Since 2000, teams who won the turnover battle won 79 percent of their games, regardless of any other statistic. It’s clear how vital turnovers should be in the minds of intelligent coaches. As far as turnovers are concerned, the No. 1 issue for a team with a quarterback as skilled and proficient as Tom Brady is not interceptions (because there won’t be many), it’s fumbles. Many arguments have been raised to try to explain why the Patriots don’t fumble as often as other teams. Many of them are challenged by some of the data. If it were coaching, former players should be able to tell us that Bill Belichick suddenly and drastically changed the way he instructed players to carry the football in the 2006 offseason. But the data show that if a mysterious trade secret were delivered, the players forgot about it when they left New England, as their individual fumble rates became drastically worse when playing for other NFL teams. The bottom line is, something happened in New England. It happened just before the 2007 season, and it completely changed this team. Any NFL investigations into allegations that the Patriots played regularly with deflated footballs would be wise to reference my research herein and to begin starting in 2006. That was when Tom Brady was able to help persuade the NFL to change its rules to allow him (and other quarterbacks) to provide their own footballs for all road games. I will reiterate, this analysis cannot say it was, undoubtedly, illegal football deflation that caused the data abnormalities. But it does conclude that something absolutely changed, and it was not the result of simple random fluctuation. Because I was asked so often for the data that I used in the first analysis, as a courtesy, I am going to link to an excel file with all the summary data used to create the graphics shown above.